AMI Membrane Housings for Home RO Systems, Polypropylene Construction | Applied Membranes Inc. 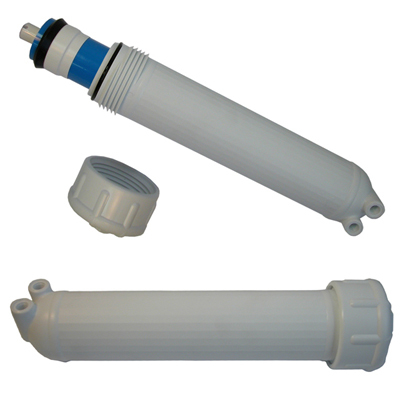 Designed for use with standard and 3" home RO membrane elements, these high quality membrane housings offer reliable performance in your RO System. Inlet and outlet ports are molded directly into the body and cap of the housing, ensuring a seamless, leak-free design. Available in two end styles to best suit your RO System’s plumbing configuration. AMI now offers Membrane Housings for 3" Residential RO Membranes for Tankless RO Systems. See details tab for product information. *PV2012FS is compatible with membrane elements up to 100 GPD only. It is not compatible with AMI 150, 180 or 200 GPD flow membranes. *Female IPS in and out ports will accomodate standard NPT male fittings when wrapped in teflon tape. Pentek 144376 is an NSF Listed Component (Other items on this page are not currently listed). This housing has been discontinued by the manufacturer, who currently offers no replacement. The recommended AMI replacement is PV2012PME.